the path it will navigate in 2017 when the American Athletic Conference announced schedules for all 12 conference teams Thursday. Kickoff times and most television designations will be announced at a later date. 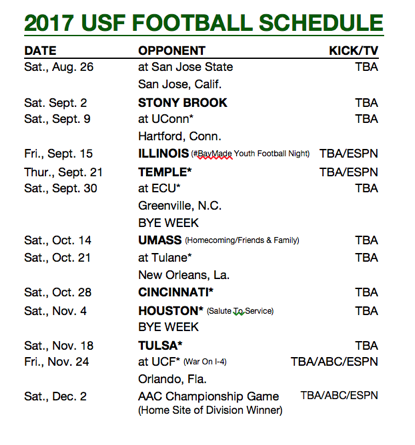 USF opens the 2017 season on the road at San Jose State on Saturday, Aug. 26 before returning to Tampa for the 2017 home opener vs. Stony Brook on Saturday, Sept. 2 in Raymond James Stadium. The Bulls will open conference play the following week at UConn on Saturday, Sept. 9 in an early season conference clash. It will mark the second time the Bulls have opened conference play vs. the Huskies and the third time playing their first conference road game of a year in Hartford. USF is 4-0 vs. UConn since beginning play in The American, including two wins in Hartford and a 42-27 victory in Tampa last year. USF will return to Tampa for back-to-back weeknight, primetime games on ESPN. The Bulls will take on Big Ten foe Illinois on Friday, Sept. 15. The first meeting between the programs and the return of former Tampa Bay Buccaneers head coach and current Illini head coach Lovie Smith will be played before a national TV. It will also be #BayMade Youth Football Night at Raymond James Stadium, with numerous groups of Bay Area youth football teams anticipated to be in attendance. 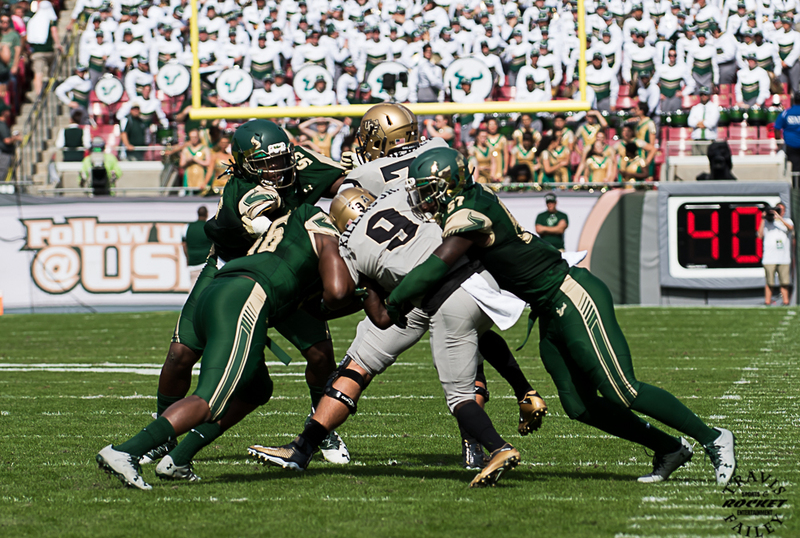 USF will return to Raymond James Stadium the following week on Thursday, Sept. 21 vs. Temple. The clash with the defending American Conference champions will be nationally televised on ESPN. The Bulls downed the then No. 21-ranked Owls, 44-23, in 2015 in Tampa before falling last year in Philadelphia, 46-30. The Bulls hit the road for a Saturday, Sept. 30 game at East Carolina before the first of two bye weeks on the year. USF will return to action for Homecoming on Saturday, Oct. 14 vs. UMass in Raymond James Stadium, the last of four non-conference games. The Bulls will make their first-ever trip to New Orleans the following week for their first meeting with conference foe Tulane on Saturday, Oct. 21. USF will return to Raymond James Stadium for three straight conference games separated by a bye week. The run begins with 2014 conference co-champion Cincinnati on Saturday, Oct. 28. The following week the Bulls face 2015 conference champion Houston on Saturday, Nov. 4 in the Salute to Service game. USF will enjoy its second bye week of the season before closing with a pair of conference games. First is a visit from Tulsa on Saturday, Nov. 18 in Raymond James Stadium. It will be the first-ever trip to Tampa for the Golden Hurricane, which posted a 10-3 record and finished second in The American West Division last year. The War On I-4 will return to Friday in 2017, as the Bulls will play their final regular season game at UCF on Friday, Nov. 24, the day after Thanksgiving. That game will be televised on ABC or one of the ESPN Networks. The American Conference Championship Game will be played on Saturday, Dec. 2 at the home site of the top division winner and will be televised by ABC or an ESPN network. USF will not face West Division foes Memphis, Navy or SMU in 2017 or 2018. USF shares the The American East Division with Cincinnati, East Carolina, Temple, UConn and UCF. 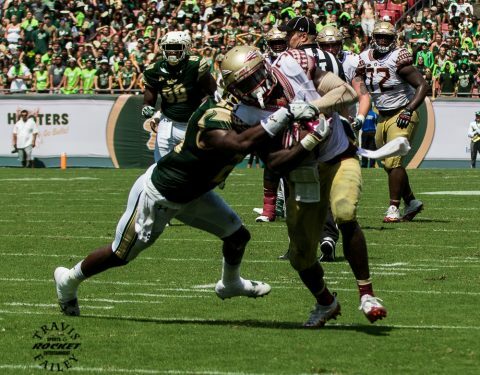 USF will host three games against 2016 bowl participants who won at least nine games last year when Houston, Temple and Tulsa come to Raymond James Stadium. The football PRIORITY RENEWAL period for all Bulls Club members begins on Feb. 3 runs through Friday, March 31. NEW football season tickets sales for all fans will begin on Saturday, April 8. Deposits will be accepted prior to April 8. FLEX PLAN packages and GROUP TICKET sales will begin on Monday, May 15. USF alumni, faculty and staff will once again receive a 20 percent discount on all football season ticket purchases. Fans can renew on-line by going to www.USFBullStrong.com or by phone by calling 1-800-Go-Bulls. Fans wishing to renew by mail can call 1-800-Go-Bulls to request a paper statement. Bulls Club members are encouraged to check their e-mail for information from USF Athletics pertaining to their renewal. 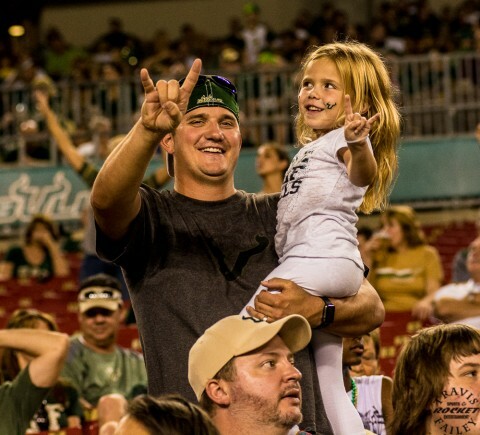 New season tickets deposits for the 2017 Bulls’ football season can be made by calling 1-800-Go-Bulls, visiting www.USFBullsTix.com or in-person at the USF Ticket Office (Lee Roy Selmon Athletic Center) Monday-through-Friday between the hours of 9 a.m. and 5 p.m.
USF finished the 2016 season ranked No. 19 in the Associated Press poll with a school record 11 wins following the program’s fifth-ever bowl victory in the Birmingham Bowl. The Bulls’ 11-2 record marked the fifth-best winning percentage in FBS football in 2016 and one of just 11 teams to reach 11 wins. USF set nearly 40 team and individual records in 2016, including team records for total yards (6,650), rushing yards (3,714), touchdowns (77) and scoring (569). Junior quarterback Quinton Flowers was named the American Conference Offensive Player of the Year and led a school-record 10 players named to the all-conference team, six of which, including Flowers, will return in 2017.